Confidence is a tricky thing for all people, not just equestrians. Too much confidence and you may make mistakes. However, if you have too little determination, you stop trying and miss out on amazing things. While your faith in yourself may change over time when you lose that faith or find it halting you in your tracks, what can you do to move forward? These three steps will help you gain confidence in or out of the saddle. It would be best if you were honest with yourself about WHY you are feeling self-conscious or fearful. For many people, this is the hardest part. Why? Because admitting to yourself that you aren’t perfect is hard. More than that, it is easier to say, “I’m scared of falling” then looking closer and understanding the real reason. Sure, you may be scared to fall. However, why are you scared to fall? Is it the fear of getting hurt? Of not being able to take care of your family? Is it the fear of your horse and then galloping off? No one likes to fall, of course. I have a terrible aversion to competing in horse shows. Some of this stems back to my childhood and my anxiety to be the best and please everyone. I found that I lost the pleasure of riding and focused instead on the growing panic. As a result of the dread curled like a stone in my stomach, I stepped away and stopped riding for 17 years. “I moved up through the riding levels, and as a teenager, I entered my first schooling show. Not a competitive person by nature, I was curious but not sure what to expect. I had a great time! While my memories are fuzzy (this was a long time ago), I remember it being just like our lessons and I was quite comfortable. As a result, I proudly won 2nd place in my first schooling show! Like most teenagers, I felt like I couldn’t fail. Here I was at my first ever horse show and winning that red ribbon out of the gate. It certainly helped my confidence, but it also set me up for future disappointment because I thought all horse shows would be that easy. On that exultation, my trainer encouraged me to enter the next competitive show at the barn. Other barns would be competing but I would be on my home turf with an advantage, or so I thought. That day seared itself into my memory. I had very little sleep because I’d been up all night nauseated with flutters of anticipation. I was at once excited and nervous considering the unknowns. Morning dawned cold and rainy on that fateful day. I was unsure where to go, and my parents had no idea. We were all green newbies. The barn was lit up and drew us, warm and inviting on that dreary day. My beautiful chestnut horse, whom I pulled at random was groomed, tacked, and ready to go for me. I led my horse, the infamous Flame, to the mounting block. We were prepared to head into the schooling ring to warm up, but my stomach was heavy with nerves. It has never surprised how empathetic horses are with their riders. I’ve seen it day after day and Flame was no exception. Headstrong on the best of days, he sensed my unease and decided the barn was infinitely more comfortable. The big chestnut gelding wheeled around and trotted forcefully back to the barn with me still astride and almost losing my head at the door. I confess that I let him. It was the “Gray Pony Incident” all over again. I felt out of control, unable to control my horse, and I completely shut down. This gelding knew that I wasn’t ready and I ceded power to him. Shaken and trembling, I let my horse decide for me and then I used it as an excuse not to ride. I dismounted, put him back in the stall, and scratched the show. There are many things we may fear. However, answering the question, “why” is the biggest battle. I fear the chaos. I fear disappointing myself. I fear I will mistake in front of everyone. Why do I care? Growing up I was the black sheep, always getting in trouble and being criticized. I was a good kid, ironically, on the honor roll and being the responsible older sister. It never felt good enough. I have never felt good enough. Horse shows compound the pressure I put on myself, and make me sick because of it. Still, to this day I have no desire to show. I’ve photographed events, attended them to cheer on friends, and supported my daughters on as well. I find when I enter a horse show, even a schooling show at my home barn that the result is terrible on my psyche. The first schooling show I tried, I didn’t sleep or eat for a week prior. I vomited that morning. Mounting up, I was shaking. Thank goodness I had a friend with me, or I probably would have backed out. I ended up winning 2nd place to my utter surprise. Was it worth it? Not for the ribbon, but to know that I could do it was worth the effort. I competed in a few other schooling shows since then, few and far between. I still hate competing, but, and it does get easier each time. I’m hoping to show Ferrous this spring as it will give us a goal. Do I still lose sleep? Yes, but it gets easier every time. This is the hard part. Once you’ve established why you lack confidence, now you need to do something about it. Better? You don’t have to go crazy. Set small, achievable goals then crush them and repeat. Don’t go for the big, bold move out of the gate. Build your confidence slowly. What do you want to accomplish? Do you have it in your head? Good. Now, how can you get there? The specifics depend on your end goal. Compete in a horse show, write a book, train for an endurance event in Mongolia, Break down your goal into several parts. Then concentrate on only ONE part at a time. Don’t think about anything else. If you think about the significant result, it can seem harder to achieve. You are bold when you are taking risks. These can be small, but when you take a, and it pays off, then your confidence grows. Continue to take these steps forward, achieve your more modest goals, and move toward the big one. Soon you will find that the big goal, isn’t so scary after all. Once you’ve accomplished that, it’s time to set a new goal! Some people view being bold and being brave as the same thing. To me, I consider being brave as pushing through the fear or self-doubt and doing it anything. Does this result in a certain boldness? Absolutely. While you are bold, you need a certain amount of bravery to keep you going. Without courage, you will be tempted to move backward, or worse, succumb to the self-doubt and stop altogether. If that were to happen, you would have a lot more trouble regaining your confidence. Bravery doesn’t always mean big gestures. Please don’t overlook the small things; those are the moments we need to celebrate. Celebrate every accomplish you make, big or small. Celebrate the fact that you are trying to challenge yourself and that you are doing something you love. Always remember that you are good enough. Take that first step to move forward. Don’t look back. And always remember to be honest, be bold, and be brave. 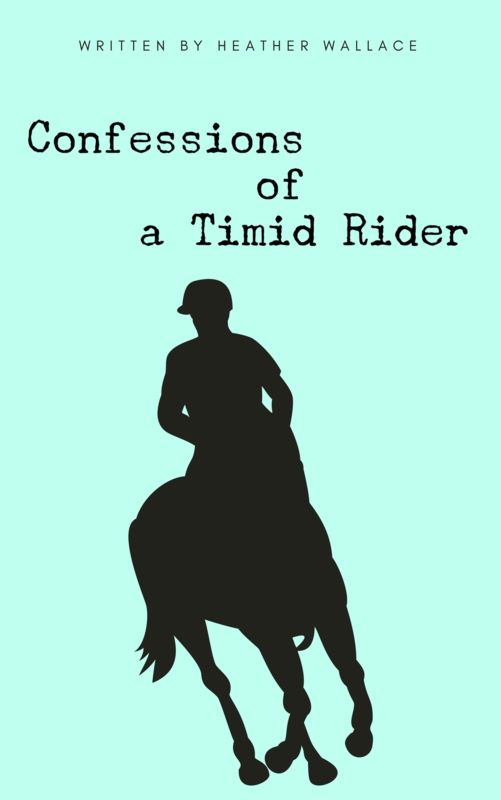 If you struggle with confidence, please read my memoir, Confessions of a Timid Rider available on Amazon. It may inspire you, but it will definitely show you that you aren’t alone. It’s also free on Kindle Unlimited! Please do, and keep me informed as to how you are going! You CAN do it, I have faith in you. “Set small, achievable goals then crush them and repeat” YES! This is so important, as I think most people go for big goals and then feel terrible if they don’t achieve them. My goal for this week? Hack out with Vallu and go ride Erik in the neighbour’s arena. That sounds like a great goal! And yes, too often we have lofty ideas that are hard to achieve, or we don’t see results and get frustrated. I’m so guilty of that. I found that if I set smaller goals, I have a much better chance of committing and succeeding! Have fun riding.